How do air plants survive? There are more than 650 types of air plants, and they come in all sizes and colors. They grow—and thrive—without soil. This plant is almost unkillable, so it's perfect for gardeners who tend to have a "black thumb." Hanging from the windowsill of your trendiest friend's kitchen, you notice, is a terrarium that's nearly empty--save for what appears to be a soil-free bunch of delicate green stalks that gently rustle in the flow of the air-conditioning. And so you wonder: What the heck is it? 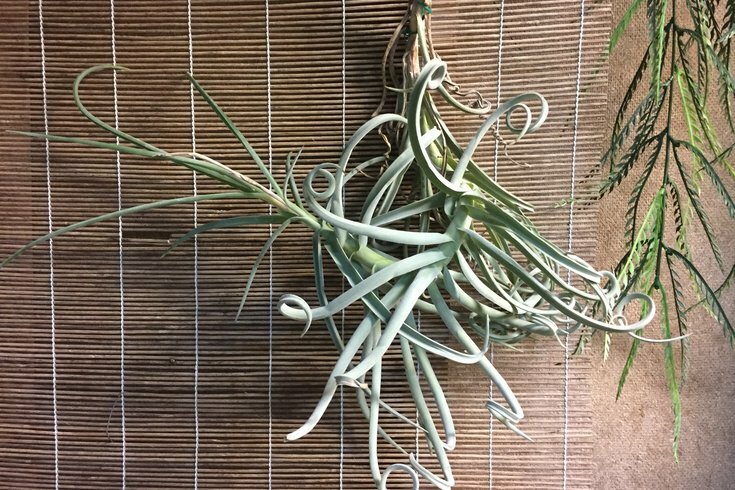 Curious to know what these bizarre, seemingly rules-of-life-defying plants are--"air plants"--we reached out to Benjamin Snyder, greenhouse horticulturist in the Department of Landscape Architecture and Horticulture at Temple University, Ambler Campus. 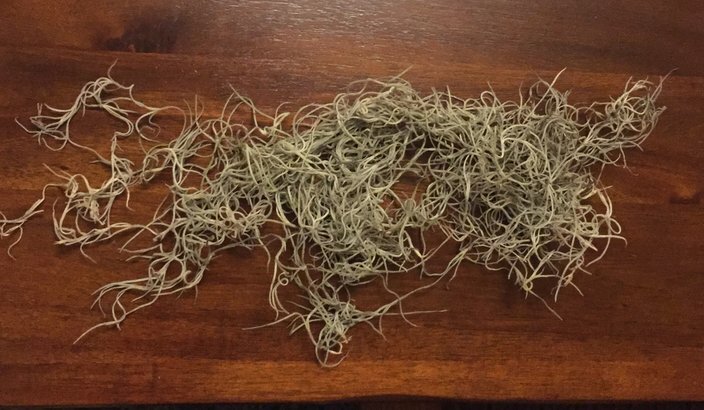 To start: Where do these air plants come from if they don’t seed in soil? It feels like a chicken and the egg sort of thing. It’s a good question. They mainly grow in the tops of trees; they produce light seeds, like a dandelion or something, and they float through the air and land on a suitable host. A few species do have relationships with ants and insects and things like that, that can carry the seeds around to a branch. Mainly, tillandsia are wind-dispersed. They grow in the crotch of a tree, where a branch comes out with a little pocket there. That’s where they’ll grow. How do they sustain themselves when not attached to a tree? Usually, they don’t exist off a tree. If they land on soil, the soil will be too wet for them and they’ll rot...There are many that will live in soil…the ones you see for sale in boutiques are tree-dwelling. And these are tropical plants? • Air plants grow by attaching to trees. They spread like dandelions: carried by the wind. • Air plants do need water; they absorb moisture in the air, in their natural environment. • Most varieties of air plants grow in the Americas, in tropical environments. • The most well-known members of the air plant family? The pineapple. With air plants, roots act as anchors, securing plants to their supports. Leaves handle the job of absorbing moisture. Do they grow in any region in particular? Mainly in the Americas. 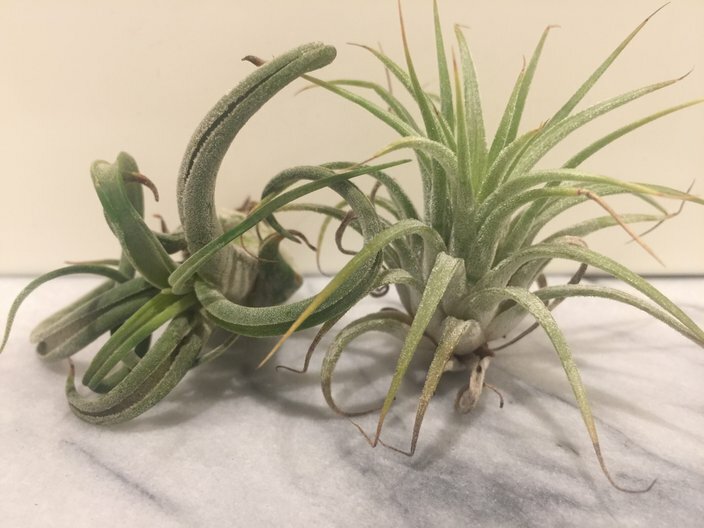 Some are Spanish; there’s a type of tillandsia native to South Carolina, Florida, and many sold in stores are closer to Brazil, or that area. So, people go out looking for air plants and sell them to retailers, or what? Many are commercially produced in greenhouses, to protect from overharvesting. They’re really not hard to propagate. And by propagate, you mean clone? Clone, or grow from seed. You can grow some sort of medium that replicates a tree and then take it off and sell it. MORE INFREQUENTLY ASKED QUESTIONS: Are some apple varieties better for you than others? | Do hotels have a history with baking? | What is a locavore? Tillandsia species, around 650. There’s a lot. Is that a lot in the grand scheme of plant life? It’s medium-sized. It’s kind of in the middle. Orchids, there are thousands of species. Other plants have only one or two species. It’s in the middle. All the air plants I’ve seen are tiny. Are there big ones? There are larger ones. For tillandsias, the largest will be about 12 inches across. That’s big for not needing soil. There are larger varieties of other bromeliaceae that grow on trees; there are some that can get three or four feet tall, but obviously those are hard to grow in a house. Meet a low-maintenance houseplant that grows without soil. Air plants, known as tillandsia, are quirky plants that hail from the Americas—from U.S. southern states to northern Argentina. How do they survive without the water portion of the equation? They get their water source from atmospheric humidity. They grow in jungles, or in South Carolina in humid environments. The leaves of tillandsias are, many times, covered in small silvery hairs, the technical term being trichomes. Those hairs pull moisture from the air and that’s where it gets moisture from. But a kitchen or living room doesn’t usually have much moisture. Especially in winter. Right. Growing these air plants indoors, the general recommendation is to soak them for two or three hours once a week. You can try to mist them, but that usually doesn’t provide enough moisture unless you do that every day. The best way to water an air plant is to submerge it in a bowl or dish of water for a few hours. Daily misting doesn't always provide the best moisture for your plant. Any sense of why these are just now catching on? It seems trendy. Horticulture in general tends to come and go. These types of plants were popular in Victorian times, the 1900s, so they’re not new--they’re just coming back. It’s probably because of their minimalist look; they’re akin to the succulent craze going on. Minimalistic plants that are mainline, modern. Why would they ever go out of fashion? They seem low-maintenance. They are. But with plants, it seems, I’ve observed people get tired of them after a while. Plenty of plants are easy to care for but they go out and become hard to find. But in 10 years, will be back again. 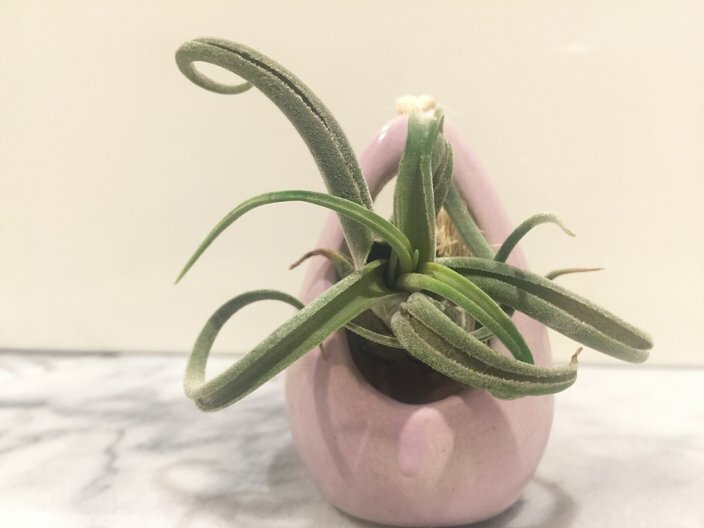 Any fun air plant facts? Fun fact: Big picture, tillandsias are in the bromeliaceae family, and there’s one edible one: the pineapple. The pineapple is one of the few that make a fruit you can eat that is still in the same air plant family.